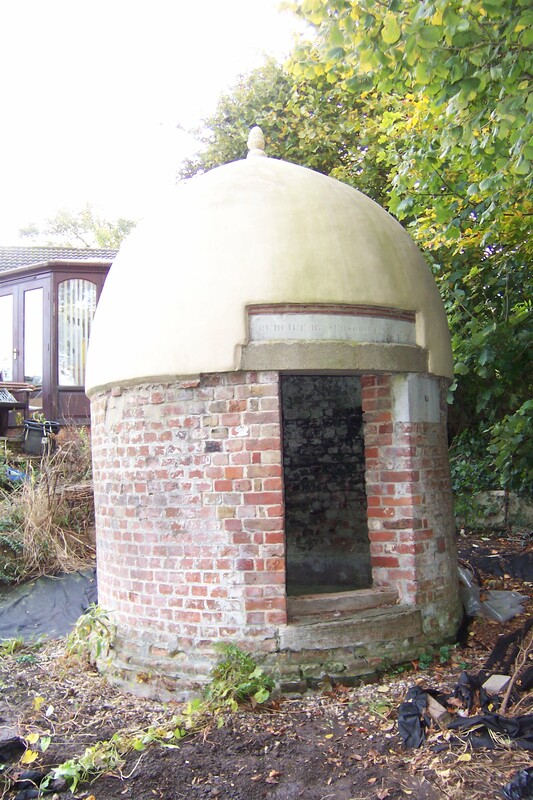 Is there a lost St. Helen’s Well…in Maldon? No survey can be thorough and frustatingly one always finds new sites or details on them after publishing as the books are a series I intend to write an appendix to list the new Essex sites I have discovered or have been informed about. One such site, mentioned in the gazzatteer of named wells in the book has now revealed itself to be a possible holy well dedicated to St. Helen. I look at the evidence and hunt for the remains of this site. So many St Helen’s Wells? Harte (2008) notes that St. Helen is the most common dedication for wells with 40% of all sites named after saints being given the dedication 50 sites in his work. I hestitate to add another to that list which both he and I were unaware of when compiling my work on Essex sites. A holy well or well by association? The only written reference to St Helen in the town, is to St Helen’s Chapel which is mentioned in 1529 will of John Padgett leaving money towards the costs of the construction of said site. However, the date is so late it is unclear whether the chapel was ever built being so close to the Reformation. No remains bar the name of the well and the lane/crossroads. No the question is, is the well named after the chapel or the chapel named after the well. There could be support for both arguments. In support of the later, one might question why a chapel is being built so late, is it built to capitalise on the spring’s importance. The only problem with this being that it does appear to be unlikely that the spring would not have been recorded separately. It is certainly an ancient site, its situation on the site of the original saxon burg is suggestive of its importance to that settlement. Furthermore, early maps show a site called Maidenspond in the area approximating to where the spring is situated. Does this suggest a Christianisation of a pagan site, the only record of which is the name Maiden? Is it a coincidence or significant that Colchester’s St Helen’s Chapel is in Maidenburgh Lane? For the contra argument, there is Essex precedence, Colchester’s St. Helen’s Chapel was situated by a well called St. Helen and the naming of holy wells by association is frequently encountered across the country. 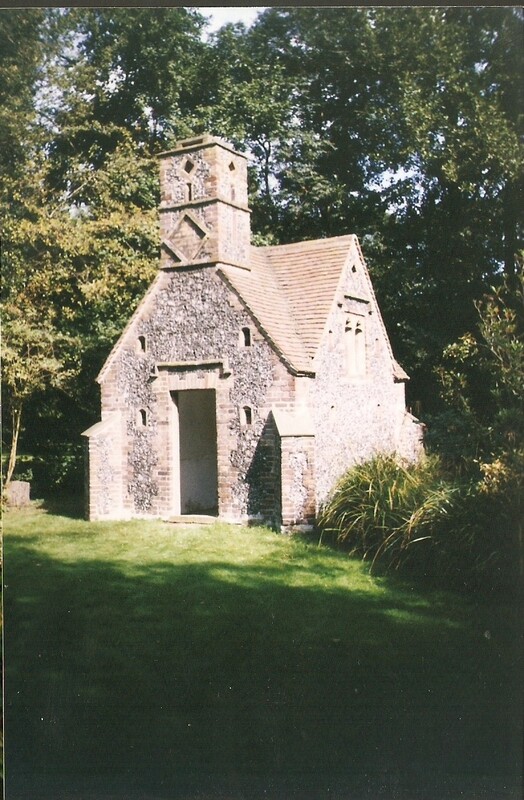 It has been also suggested that St Helen chapels or churches were often renamed All Saints and indeed St. Helen’s Well is in All Saint’s parish. There is of course an All Saints Well in Colchester as well and Ipswich has a St Helen’s church so being midway between the two it may be genuine. Later life as the Cromwell? The spring itself does not appear, above notwithstanding, until 1587 when Thomas Cammock paid for Maldon’s very first convenient water supply piped in a 600 yards lead conduit from his well in Beeleigh Road (the ‘Crom’ or ‘St. 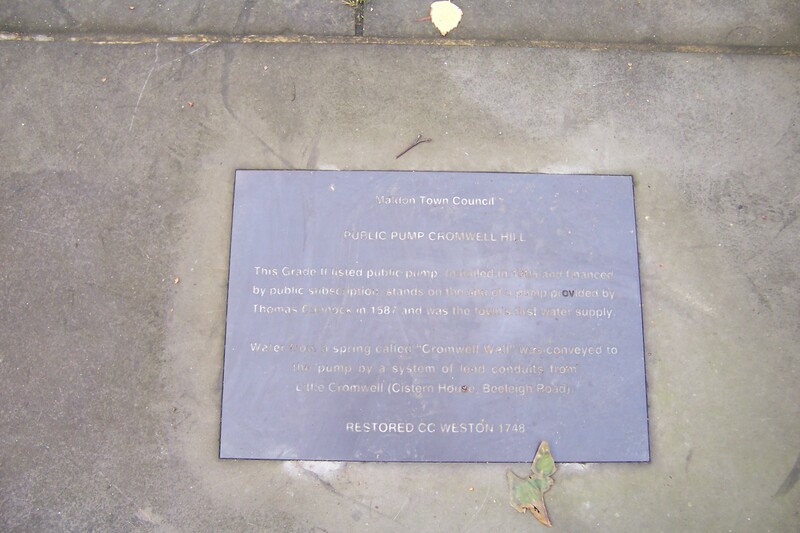 Helen’s Well’) to a pump on St. Helen’s Lane (now Cromwell Hill). The name Crom probably derives from O.E. crumb for crooked and may explain the winching equipment or its difficult position to get to, which describes it well now as the actual spring head does not appear to be traceable. 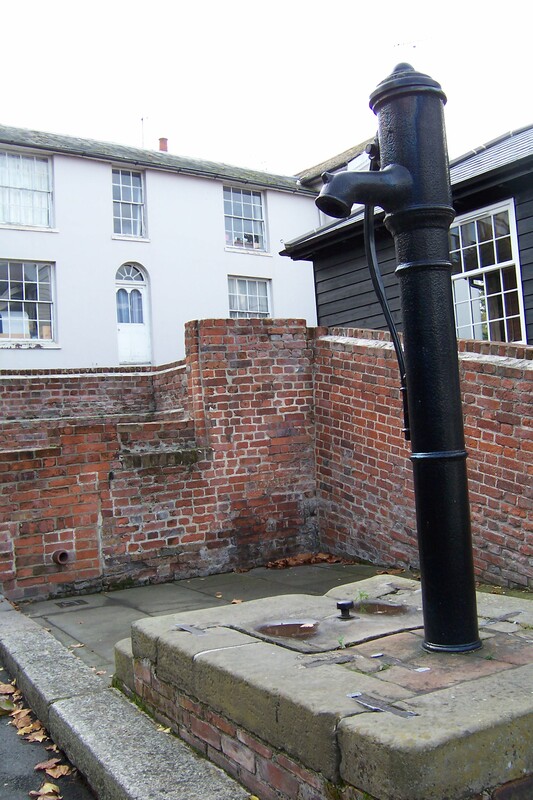 Fortunately, two relics survive, the ‘cromwell pump’ on Cromwell hill and the cistern which feeds it above it in a private garden on Beeleigh Road and as such is not easily accessed. The pump, cast-iron shaft with spour was constructed in 1805. It is situated on a rectangular stone platform with brick plinth and stone slab well cover. The whole structure stands within a granite kerbed enclosure with a retaining wall with steeply raking top and curved corner to north. To the south-west is the lower part of a square brick chamber with stepped opening to street which may have been used to provide water for animals. The supply came from the cistern house which originally would have used the water from ‘St Helen’s Well’. 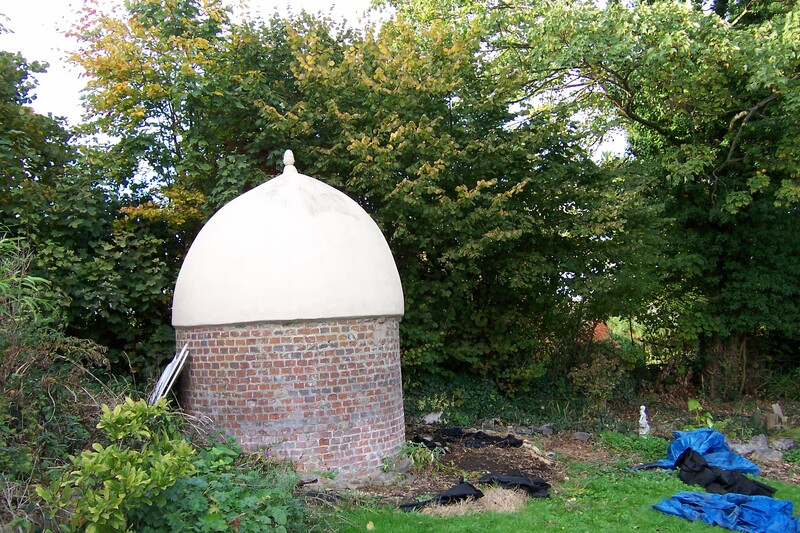 This cistern house has structure dating from 1587 and 1805. It is red header-bond brick with Roman cement-rendered dome. with a circular brick structure with narrow entrance door, enclosing water cistern which is full of water and drains into a small pond nearby. Over the door is a stone lintel with panel inscribed ‘REBUILT BY SUBSCRIPTION 1805’ in Roman lettering. 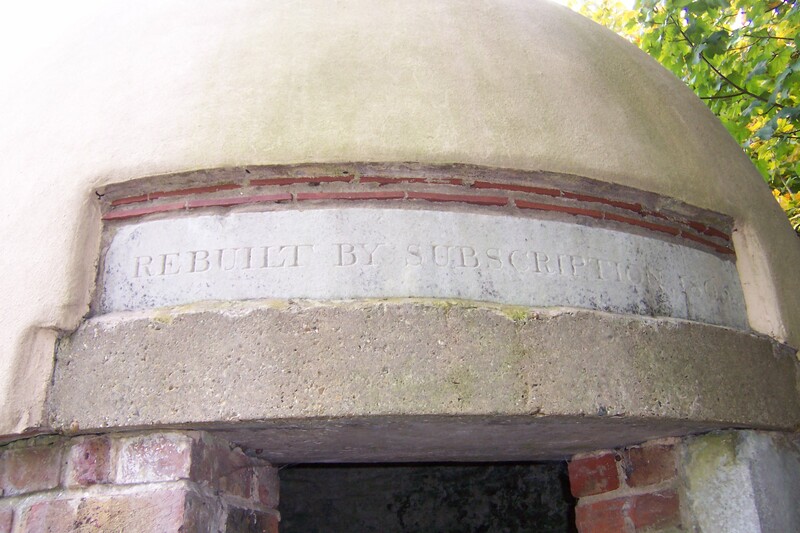 The only pictures of the cistern show it overgrown with ivy and slightly derelict, but is pleasing to note that the present owner undertook a fine repair job replacing the original acorn finial and Roman cement and ensuring the water supply does not overflow the chamber by repairing the piping. Harbus, A., (2002) Helen of Britain in Medieval Legend, 2002. Jones, G., (1986) Holy Wells and the Cult of St. Helen. Journal of the society of Landscape studies. A Yorkshire field trip: Conisborough’s two holy wells! A visit to Conisbrough, noted for its Norman castle should include a visitor to its holy wells. That is holy wells, as the town can claim two sites! Although according to the Conisborough website there appears to be a denial of this. Who the St Francis is, is unclear but Alport ( 1898) records the local tradition which states that he was a local holy man and probably not a true saint and it is interesting that a number of churches are dedicated to a St. Francis in Yorkshire. Interestingly, though the date of creation of the well is recorded and quite late compared to other local saints perhaps. It is said that in 1320 -1321 the village was suffering from a particularly terrible drought and this St. Francis, said to be an old and wise man was sought for his advice. He suggested that the local people cut a willow tree from Willow Vale and then as the people sang psalms and hymns he lead them through the church and priory grounds to the site of the well. At the spot St Francis then struck is and not only did a spring arise and followed for the next 582 years (for its sadly dry now) but the tree took root. Sadly this tree has either died or was dug up but the well continued under the name of the Town well up until the early 1900s when mains water arrived. It is possible that the legend suggests the holy man may have been, in fact, Clark (1986) believes the story recalls a Pagan priest and that the legend was a legacy of Conisbrough’s pre-Christian past; certainly the reference to a willow indicates a water diviner. The other area in Conisbrough where St Francis the older man is said to have done a similar ritual and found water is at a place called The Holy Well Spring of St Francis. 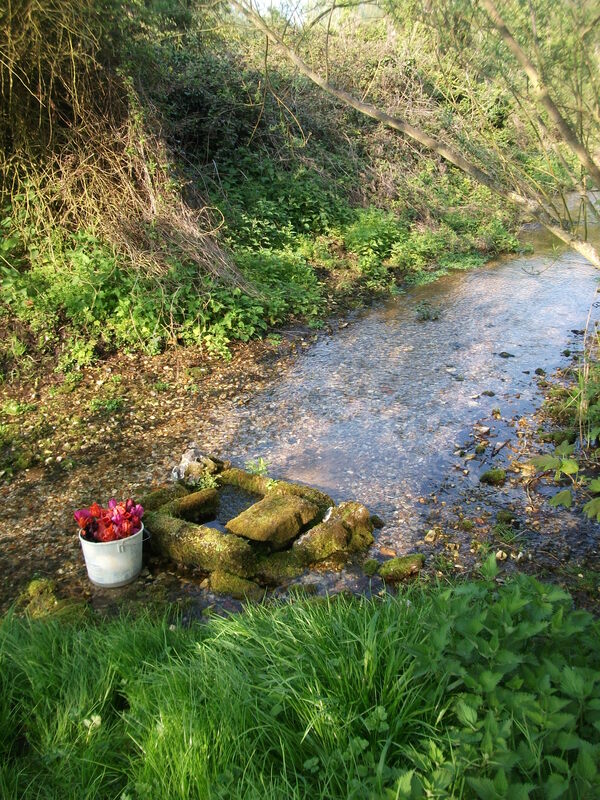 In 2003 this holy well was restored by historian Bernard Pearson with the aid of Community service and a special service was held at St Peter’s church attended by the High Sheriff of South Yorkshire who than processed to the site, erroneously as it happens in a re-enactment that was associated with the town well. Indeed a plaque at the site makes this error clear. Clark, S., (1986) The Holy well of Conisborough Source Old Series 5. Innocent, C.F (1914-18) Conisborough and its castle Trans of Hunter Archeaology Society. on the re-dedication of the well. In preparation for a volume on Holy and healing wells of Norfolk, a county with a high number of interesting and surviving sites, I was in North Norfolk doing research. Of course this area of Norfolk is dominated by the Walsingham wells, more of perhaps in a latter post, but I would like to focus on three less well known sites. the monks walked to the wishing wells nearby to drink the cool water, which is claimed to make wishes come true. These appear to be the same as that marked as Our Lady’s Well on the 1880s OS. The The spring has nine or ten sections of stone work around it as it arises close to the edge in the bed of the gravel stream. It is probable, especially as some of the stone work appears worked and may have come from the friary or was constructed by the friary although it does not seam as substantial as one would expect. Nearer the road is a rectangular stone lined ‘tank’ which may be associated with the spring and indeed may be it, as the older OS maps it is difficult to identify the exact site. I failed to find Lady Bone Well, at Coxford. A site said to be near the remains of the Augustinian abbey and obviously its water source. One would assume a name after Our Lady, although Bone would be difficult to explain. Indeed, its name is said to be after a lady of the Priory who was drowned in the well by the priests of the priory; an odd lesson which I have been unable to date but is doubtlessly Reformation in origin. A visit by NAU in 1978 found the surrounding wall in reasonably good condition, approximately 30cm high and 1.8m in diameter, is broken in three places. Its water reaching ground level and its overflow joining River Wensum some 27m to the south. However, by 1990 it was thought to be in poor condition. 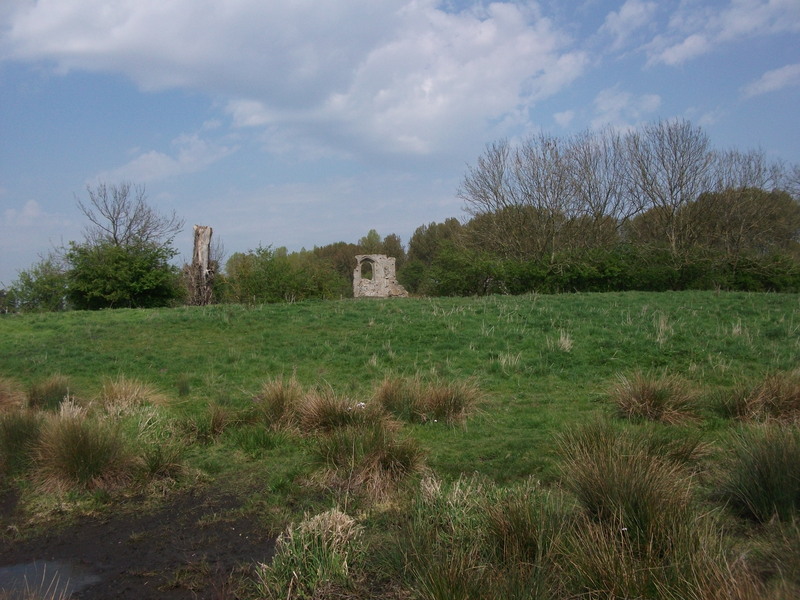 and indeed my visit failed to find any evidence of a springhead at the site and it appears to have become very overgrown and lost in a marshy area. The small village of Sedgeford does have a Lady Well, although only marked in blue italics on the current OS giving some doubt to its age. Little is known of the well, but I was told of processions that have gone to the well and one would expect that its water was used by filling the church font. 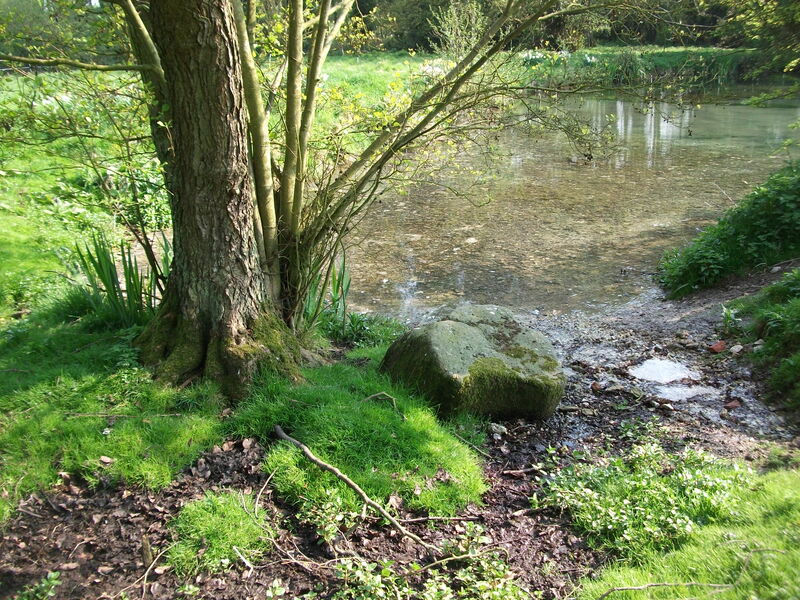 Little appears to be recorded of this spring but its location not far from the parish church is significant. 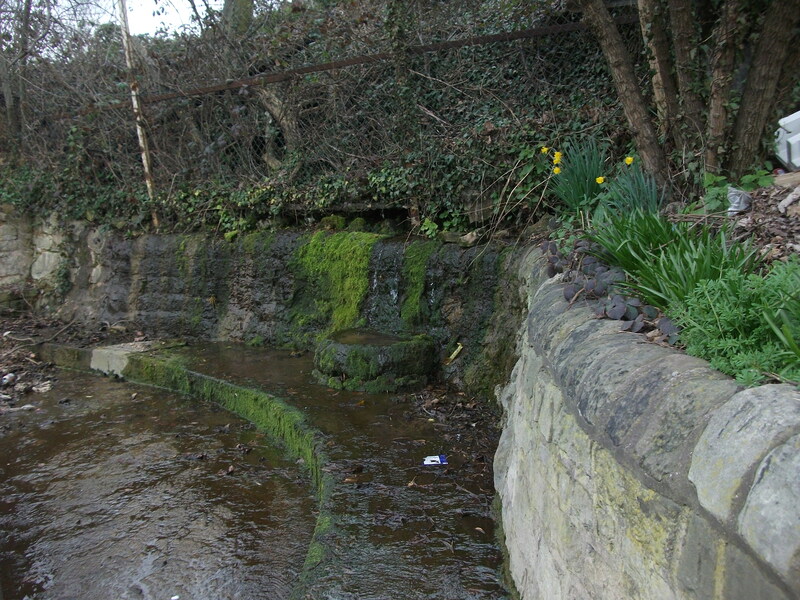 The spring flows from the bank forming a chalky stream and into a large pool. Significantly perhaps there is a large stone beside it. More of Norfolk holy wells and springs later….